Big and beautiful, the Red-tailed Catfish is an enormous attraction! The Red-tailed Catfish Phractocephalus hemioliopterus is easily recognized and one of the most attractive of the catfish species. As a member of the Pimelodidae family it is long whiskered, but Its beautiful red tail and white belly are its unmistakable characteristics. This fish is the only member of its genus and with its distinct appearance, it's only confused with an occasional hybrid that may appear from time to time. 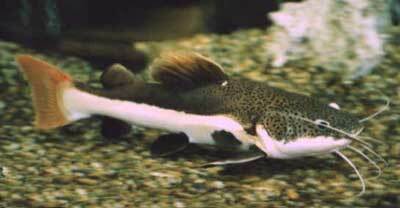 It is also known as the South American Red Tailed Catfish, Banana Catfish and Redtail Catfish. Flat-nosed Catfish and Antenna Catfish are generic names applied to this fish as well as some other members of its family. Even though the Red-tailed catfish is one of the larger fish in the Amazon, this is not a food fish for the natives. It has a dark colored flesh and according to Dr. Herbert R. Axelrod, in his book 'Aquarium Fishes of the World (1998)', the natives will only eat white flesh. According to Wikipedia, in an attempt to develop a viable food fish they have been hybridized with other fish species, like the Pseudoplatystoma sp. of Tiger Shovelnose. The resultant hybrids are generally known as Tiger Redtail Catfish. These will sometimes show up in the aquarium hobby under various common names. Red-tailed Catfish are not real active and would prefer a large cave or den to hang out in. If the tank is dimly lit, then just a few large pieces of bogwood will suffice. These fish are actually quite peaceful, but they have a big mouth and a hearty appetite. They can't be kept with smaller fish as these tank-mates will become lunch sooner or later. They are also territorial with their own kind as well as other catfish from the Pimelodidae family, but are fine kept with other same-sized large fish with a similar temperament. The Red-tailed Catfish Phractocephalus hemioliopterus was described by Bloch and Schneider in 1801. This fish is from a genus that is over 13.5 million years. It is said to be the last living fishin its genus, yet there are reports of a possible undescribed member existing from Acre, Brazil. These catfish are found throughout much of the Amazon, Orinoco, and Essequibo river basins of South America. They occur in Colombia, Venezuela, Guyana, Ecuador, Peru, Bolivia and Brazil. They have also been record in the United States as nonindigenous species in Florida, Nebraska, Missouri, Tennessee and multiple reports by anglers in Texas. They were probably released by irresponsible pet owners. They are not listed on the UCN Red List of Endangered species. Other common names they are known by are South American Red Tailed Catfish, Banana Catfish and Redtail Catfish, along with Flat-nosed Catfish and Antenna Catfish that are generic names applied to some members of the Pimelodidae family. The Red-tailed Catfish is a large fish. It has a rather cylindrical, arrow-shaped body with a flattened belly and a laterally compressed tail. Their shovel-like mouth is moderately depressed and is as wide as the body, with "whiskers" or barbels that are unusually long. The eyes are set on either side of the head near the top. The color is dark gray on the top of the body, covered with small darker spots. The lower part of the mouth is white, The white then extends in a broad horizontal stripe back to the tailfin. As a juvenile this white stripe joins with the white under the mouth, but as it gets older it is broken up just before the mouth with dark gray coloration. The tip of the dorsal fin and the tail fin are slightly pinkish red. They will generally reach up to about 4.4 feet (1.35 m) in length in captivity, though in the wild they are documented to reach up to 5 feet 11 inches (1.8 m) and weigh as much as 180 pounds (80 kg). They have an average lifespan of up to about 20 years. Size of fish - inches: 53.0 inches (134.62 cm) - They will generally reach up to about 4.4 feet (1.35 m) in length in captivity, but there are reports of fish reaching sizes upwards of 5 feet in the wild, and the largest documented size was 53 inches. Although these fish are quite hardy, they get extremely large and so are not recommended for the average aquarist. They should not be kept in a home aquarium unless the fish keeper has a huge tank of at least 1000 gallons (1500 gallons or more for the larger specimens) and the money to maintain such a large fish. They should only be kept by advanced aquarists that can meet the tank requirements and financial responsibility for the entire lifespan of the fish (20 years or so). They are best left to public aquariums. These fish are very popular as small young fish, but because they grow so fast and get so large, many aquarist try to donated them to local aquariums. But these public facilities are now are so overpopulated that they have to turn most donations away. Aquarium Hardiness: Difficult to Impossible - Though a very hardy fish, they are difficult to Impossible for most aquarists to keep. They require a massive tank and a diet of live fish. It is generally agreed upon that this fish is not really suited for the home aquarium. Aquarist Experience Level: Advanced - This fish is too large for all but the most extremely oversized of tanks. Red-tailed Catfish are omnivorous but prefer meaty foods. As juveniles, they will generally eat all kinds of live, fresh, and flake foods. To keep a good balance give them a high quality flake food or pellet everyday. As they grow go offer higher percentages of pellets, live or frozen foods, and fruits. Be cautious as these fish will and can eat anything that fits in their mouth, including filter parts and heaters. They should not be fed the meat of mammals, including beef heart and chicken. These types of meats contain lipids that these fish cannot metabolize properly. This can can cause problems such as excess deposits of fat and even organ degeneration. Also be cautious with feeder fish like goldfish or livebearers, such as guppies, as they can introduce disease unless properly quarantined and medicated as needed prior to feeding. Once these fish mature it is very important to vary their eating schedule as overfeeding can kill them. These fish will only require one large meal per week and then the rest of the week will be used to digest the food. When these big fish eat they get very sluggish, and then will not get really active until they are ready to eat again. So their feeding times will vary depending on their digestion. Flake Food: No - Only as a small juvenile will they consume flakes. Tablet / Pellet: Yes - This fish will ocassionally accept processed foods but prefers a diet of live prey or meaty foods. Feeding Frequency: Weekly - Juveniles should be fed about every other day, but as the fish ages this should be reduced to a weekly feeding. Reduced activity levels and its preference for a high protein diet will otherwise lead to excessive weight gain. These are hardy fish, but do best with a large sump filter system to keep the water clean and circulating. If needed, they will swim to the top and gulp air and then swim back down to the bottom. This behavior is a good indicator that the water quality is deteriorating, so if it is a common occurrence than it's time to check your water parameters. Weekly water changes of 30% a week are necessary, and important to keep this fish happy. Water Changes: Weekly - These fish require water changes of 30% a week. Red-tailed Catfish are monster sized fish, though not overly active. The absolute minimum size for an adult is 1000 gallons with a large sump filter system. For larger specimens 1500 gallons or more will be needed. Juvenile specimens grow very fast and will quickly need a large tank. Upgrading to a larger tank will be necessary as they grow, and this is a stressful thing for the fish. You can transfer the old tanks water to the new tank to help make sure the water parameters are the same. The upgraded filter can also have material transferred from the old filter to help with cycling the tank. Its best if the nitrification cycle is complete before transferring this fish. The decor is not very important for this large fish as they will most likely destroy or rearrange the entire tank. Large branches and big rocks are usually good if you want to add some decorations. To be comfortable, the tank lighting should be subdued unless you have a cave or den for the fish to hide and be comfortable. It is best to use external filters and heaters; these monsters have been known to eat them and this can cause death to the fish. Minimum Tank Size: 1,000 gal (3,785 L) - 1000 gallons is the absolute minimum for an average sized fish, 1500 gallons or more will be needed for larger specimens. Juvenile specimens will quickly outgrow a small tank, and if kept in overly cramped quarters this species will not survive. Lighting Needs: Moderate - normal lighting - They prefer a dim tank if there is little decor, but will do fine with normal lighting if provided a cave type enclosured space to hide in. Water Region: Bottom - These fish will swim in the bottom of the aquarium. As they get older, they may stay motionless for long periods of time. The Red-tailed Catfish are generally a good community fish with tank-mates their own size. However they are territorial with their own kind as well as other catfish from the Pimelodidae family. In public aquariums they are put in large groups and remain peaceful, but they are in enormous tanks. Don't keep them with fish that are much smaller since theses catfish are predaceous, and the smaller tankmates will be eaten. Temperament: Large Aggressive - Predatory - Peaceful although somewhat territorial. Red-tailed Catfish are highly predatory. Same species - conspecifics: No - They are territorial with their own kind as well as other members of the Pimelodidae family. Peaceful fish (): Monitor - They are fine with same-sized fish, but will eat anything smaller. Slow Swimmers & Eaters (): Monitor - Peaceful with same-sized fish, but smaller fish will be eaten. Shrimps, Crabs, Snails: Threat - is aggressive - They feed on crabs and other crustaceans in the wild. There are no reports of the Red-tailed Catfish having been successfully bred in aquariums. Breeding has been accomplished in South American fisheries however, via the use of hormones. These fish are used primarily as a food source but some make it into the aquarium trade. 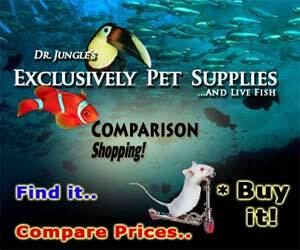 For general information on the breeding of catfish in the aquarium, see: Breeding Freshwater Fish: Catfish. Ease of Breeding: Unknown - This fish is too large to be bred in a home aquarium. The Red-Tailed Catfish are very hardy but are subject to the same diseases as other tropical fish. Disease is not usually a problem in a well maintained aquarium and these catfish are very resilient. High nitrate levels can cause catfish to develop infected barbels; which makes it difficult for them to navigate and eat normally. Maintain nitrate levels below 20 ppm through regular water changes. The Red-tailed Catfish is available from time to time and is moderately expensive. Hello, I purchased a red tail catfish that is very small at the moment (1 inch). When I put him inside my 120 gallon tank he immediately swam to a corner and tried to bury himself in the gravel. Is this normal? I also have 5 bala sharks, 3 clown loaches and a african catfish. I put him in a breeding container for now so he can actually get food. He doesn't move to much but occasionally swims frantically like he's trying to escape. The water quality is good and there is plenty decorations and hiding places but he kept trying to bury himself forcing me to place him in the breeding container within the tank. I do plan on upgrading tanks as he gets bigger and willing to build a pond. I'm guessing he's getting acclimated. Your pond idea sounds great. I've used indoor ponds for large freshwater fish (as well as large marine fish) with great success. I currently only have an outdoor pond (1300 gallons) for my koi and Red-eared Sliders however, but it is working great too. So good luck to you and keep us posted! This is exactly what my lungfish was doing before he died. Sounds like its cotton wool disease. It effects them from the inside out. But not to worry! My etc was in the same tank and he was able to recover from it with the help of medication I bought at the pet store. I used maricyn 1 and 2. Try to get the liquid form it works better than the powder. He will likely lose his appetite for a week or 2. Just give him feeder gold fish he should eat them. Make sure you take everything out of the tank and clean it really well. Best of luck to you and your fish! mine did the same thing, i was told by an exotic fish dealer. This is them searching for food they have a voracious appetite. once its lil belly gets filled he'll calm down. Pls! Guys help me. . . My new bought 2 red tail cat fish aren't eating why is that? Pls. . Help me guys one is 3to 4 inch and other one is 4 to 5 inch. . . Pls help me i try to gave him meat, fish ,fish food nothing eating. . . And i note the smaller fish's belly is like a ball. . . Pls help me why are they eating? I have found that hand feeding them when they are babies works as they age they are able to feed on live fish ect.